The Railroad Cafe and In-Between Stitches sections remain along with the other western section which is empty (it was BlockBuster, Casa Orozco (during their renovation), Billy G's, etc.). The remaining buildings will be demolished in January or February. The original plan for condos on this site fell through. The city now owns the property. The eastern portion of this site will house the 2000 seat Regional Performing Arts Theater scheduled to open in the fall 2011. The eastern end of the shopping center. The doors just to the right of center are from when Swenson's Ice Cream was there. The western side after the first day of demolition. This area was the western part of the grocery store. 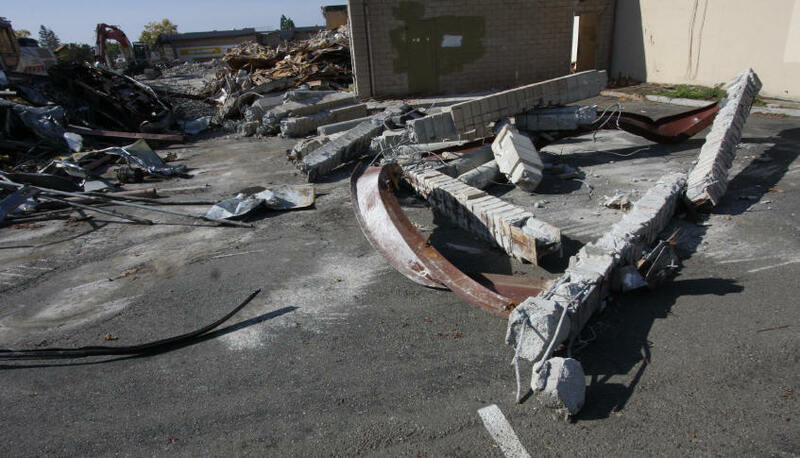 The stores to the east (right) of the grocery store after the first day of demolition. Some metal rubble, and the eastern stores. Railroad Cafe on the left. The Grocery store is (was) in the center. A similar view, but from ground level. The grocery store is on the left, the eastern stores on the right.